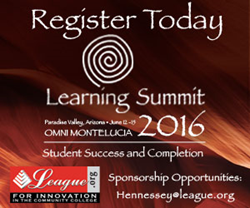 Featured cast and producers of the acclaimed documentary, No Greater Odds, are scheduled to provide a unique keynote address at the 2016 Learning Summit, June 12-15, in Paradise Valley, Arizona. The documentary follows the inspirational stories of five community college students. Their stories—of complicated family issues, financial difficulties, and other personal obstacles—are the stories of millions of students who attend community college in the hopes of bettering their lives and futures through higher education. By sharing these stories of struggle and triumph, these students understand that the way their story ends depends on how it begins—because for them, there are No Greater Odds. Highlighting the mission of access and student success of community colleges everywhere, No Greater Odds underscores the unique and integral role of these higher education institutions. Immediately following the special screening of No Greater Odds, members of the film’s cast and the producers—all from the College of Southern Nevada—will participate in a panel discussion about the film, providing a more intimate look at each of the students’ inspiring stories. Panelists will also discuss the college-wide participation in all aspects of the No Greater Odds project and learn about the No Greater Odds movement during this interactive session. Additional information about No Greater Odds is available at http://www.nogreaterodds.com. Visit the Learning Summit website to learn more about this innovative and through-provoking professional development experience. Corporate sponsorships are available. The League for Innovation in the Community College is an international nonprofit organization dedicated to catalyzing the community college movement. The League hosts conferences and institutes, develops print and digital resources, conducts research, and leads projects and initiatives with more than 800 member colleges, 160 corporate partners, and a host of other government and nonprofit agencies in a continuing effort to make a positive difference for students and communities. Information about the League and its activities is available at http://www.league.org .